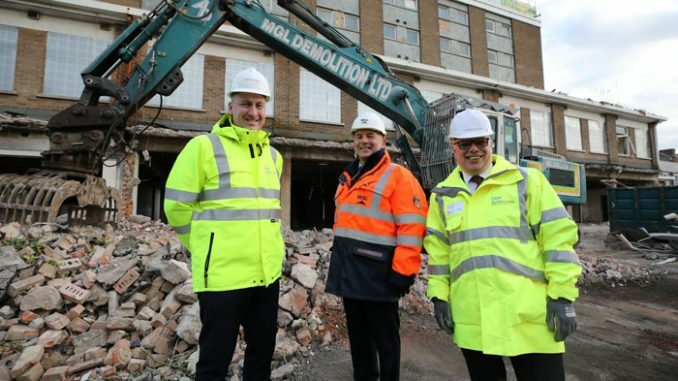 The regeneration of Stockton’s former Victoria Estate has taken another step forward as the demolition of Elm House gets under way. Stockton Council is demolishing the five-storey block of flats on behalf of Thirteen. Due to be completed in March, the resulting site will be used for new affordable housing and complement the regeneration of the remainder of the estate. Councillor Nigel Cooke, the council’s cabinet member for regeneration and housing, said: “This is an important milestone as we take a step closer to our wider vision for the future of Stockton’s town centre. “The flats in Elm House were no longer viable and there’d have been a significant cost to bring them up to today’s standards – it is much better to use the site for new affordable housing. “This will complement the wider project to redevelop the adjacent Victoria Estate, which is a key piece of the jigsaw in terms of the town’s regeneration. Meanwhile, plans for approximately 140 two, three and four-bedroom homes on the remainder of the estate were given the green light last year. The homes will be developed by Keepmoat Homes in a joint venture partnership with the Council.